I really think that I could eat tacos every day of the week. In my quest to find and try new versions I have come across some very interesting flavor and ingredient combinations. Take these tacos, for example. I have never cooked with beef short ribs before or tried a radish, that I’m aware of. I’m all about expanding my horizons these days. And as if trying the new ingredients wasn’t exciting enough, I also got to use the slicer attachment for my food processor, to cut the cucumbers and radishes. Hey, I’m easy to amuse…what can I say. It was an exciting day in the kitchen! Another crock pot taco recipe, and one that J has already requested again!! For a man that’s easy to please food-wise, if he specifically requests something, that means it really made an impressions. So…that means these little tacos were freaking amazing!! Oh, and the new ingredients…love them both! Not sure I would eat a radish on it’s own, but in this vinegar-y slaw they were delish! Getcha some!! Spray your crock pot with non-stick cooking spray and place the short ribs to the pot. Whisk together the soy sauce, sugar, vinegar, garlic, ginger, sriracha, sesame and olive oils. Pour this mixture over the ribs in the crock pot. If it looks like too little liquid, feel free to add 1/2-1 cup of water. Use two forks or a stand mixer with paddle attachment to shred the meat. Return the shredded meat to the crock pot to soak up the remaining juices, for about 15 minutes. To make the cucumber slaw, slice the cucumber very thinly and sprinkle with salt. Place in a colander and let sit for up to an hour over a bowl or in the sink to extract some of the water content. Shake additional water from the colander or pat with paper towels. Meanwhile slice the radishes very thin and place in a medium-sized bowl. Transfer the cucumbers to the bowl with the radishes and add the rice vinegar and red pepper flakes. Toss to coat and refrigerate until ready to use. 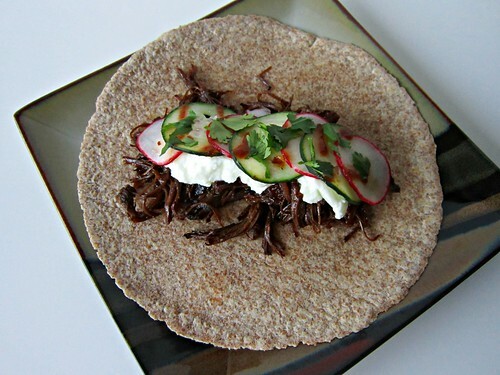 To assemble, warm your tortillas and top with the shredded meat, a spoonful of greek yogurt or sour cream, cucumber-radish slaw, cilantro, and a squirt of sriracha for some added kick. Yum. We eat tacos a lot. I'm super impressed with how many different ones you come up with/find! I love how ethnic cuisines are doing lots of fusion. The Korean taco is one of my fave fusion dishes – thanks for sharing! G'day! I love infusing or “introducing” two different cuisines too! Love your photo and recipes! looks and sounds YUM too!